It’s no longer a question of whether or not you’ll have an electric car. The question now is: When? and what color will it be? A small company in California has made the strongest effort yet to end your recurring nightmare about battery operated cars: It’s a dark rainy night and you’re muttering bleakly to yourself as you guide the slowing little electric “econobox” to the side of a dimly lit highway. The battery is dying, the lights are dimming, and the wipers are slowing. And your heart is sinking because you know there are no electrical outlets or clean bathrooms for miles. Not a pretty picture. Tesla Motors, maker of a new breed of high performance electric cars, has addressed your three major concerns. One, Tesla calms I'll-never-make-it-home fears with a mileage range of between 240 and 300 miles per charge. Far beyond the mileage required for the average daily commute. Two, Teslas perform exceptionally well against what are considered current standards of comfort, safety and speed. And three, rather than looking like mobile meat lockers, both sport and sedan Teslas are unquestionably among the most handsome of cars. So how does this happen? Well, for one thing the evolution of the current modern car has laid the groundwork for Tesla’s acceptance. Cars have changed dramatically from the finned behemoths of the ‘50’s. But our continued demand for greater efficiency in transportation, combined with the volatile politics of fossil fuels and the myriad finicky computers that control every aspect of the modern car, have created a huge opportunity for a simple and innovative solution. Mass transit systems, high speed rail, even bicycles, hold little appeal in this huge country as they are often deemed transport for students, the poor, or the environmentally awestruck. Enter the Tesla. Forgetting for a moment that coal fired generators supply the electrical charge, this car is attractive, comfortable and environmentally friendly. Surprisingly, the Tesla Roadster Sport model, the only flavor available at this point, can trace its roots to the innovative Lotus Car Company of the Sixties and their popular Elan model. When the Lotus Elan first hit the roads and tracks of America, it had as disruptive an impact on the dinosaurs of its day as the Tesla is having on accepted technology today. At that time, the Elan’s nimble handling, great brakes and Ford Cosworth 1.55 liter twin cam engine pitted it against the likes of Corvettes, M-B 300Sl's, Porsche Carreras, anf Ferrari 250Gt's in SCCA B-Production racing. It proved to be a very competitive car, setting a standard for small car speed and agility for years to come. 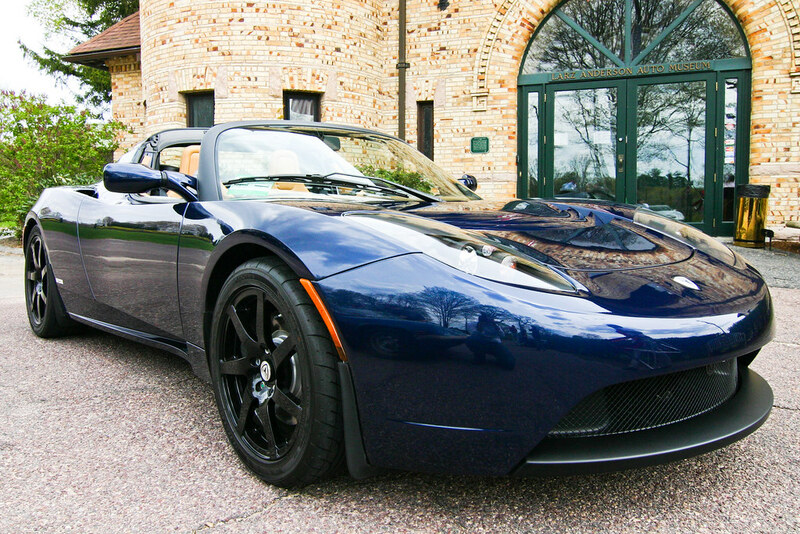 Today, the Tesla’s rolling chassis is built in the original Lotus Cars plant in Hethel, England. The body is 4” longer than today’s Lotus Elise model, successor in spirit to the Elan. The Tesla is styled after the Elise but its body is made of carbon fiber rather than fiberglass. This adds great structural rigidity and lightens the car by 200 lbs. The “glider”, as it is called at that point, is then shipped to California where battery power components are added and the car is finished to the customer’s specifications. Customers spec their car on the Tesla website. That’s right, no local dealerships. This transaction is all done online and you are always a single keystroke from canceling the whole deal. But if you don’t, your local UPS delivery truck will bring your brand new Tesla to your doorstep in somewhere between 90 and 120 days. And your neighbors will all deem you to be either an eco-weenie or a visionary. Comfort yourself, at some point, whether in reality or in their dreams, you will silently glide by them all at the local Mobil, a spot you wont have visited in months. While Tesla is currently assembled in the United States from parts made elsewhere, a government subsidy to encourage further electric vehicle development will change all that. But Tesla Motors’ fate will not be determined by politics and environmental demands alone. This company will also need to succeed on the merits of its products, and its first offerings bode very well indeed for that to happen.